These small backyard tips give clever decoration and strategic design ideas to maximize your space. Many residential areas are looking to build more homes in smaller spaces. This means smaller plots, smaller homes, and smaller backyards. Whether you’re designing for a small home or small backyard, you have the same objective: maximizing space. Most homeowners want to use their space for outdoor entertaining and find it difficult to create the experience they want with limited space. Decks and patios are classic designs for backyards of any size. If you plan on doing some outdoor entertaining in the warmer months, these surfaces give you a stable surface for dinner parties and a dry area after a summer storm. While decks and patios will have some differences in design and functionality, their furnishings are very similar. You can utilize either design to make the most of your small backyard. Raised decks are a great way to enhance your space and maximize the space in your small backyard. Many homes that have limited space in their backyard are placed on narrow plots where the homes are built vertically. You can apply the same principle to your small backyard ideas. A deck creates space outdoors that you wouldn’t have otherwise. You can have your outdoor entertaining space with a finished deck, but keep your backyard open and full of green space. If you don’t want a full deck installed in your backyard, a smaller balcony may fit your home. Balcony designs range from ornate Victorian styles to a simplistic space. A balcony’s footprint will be smaller than a decks, but the flexibility of the space will be much more limited. It’s the best fit for a home that wants a small raised deck, but wants the backyard to be the main focus. The beauty of a raised deck in a small backyard is that it creates square footage that you wouldn’t have had otherwise. Not only are you creating the outdoor entertaining space on your deck, but you’re also opening up the space below the deck as well. Discover how a spiral stair can help optimize your small yard. Request a consultation, or contact us directly at 1-800-368-8280. Deck stairs are a major consideration when it comes to installing a deck in a small backyard. By connecting your deck or balcony to the rest of your outdoor space, you’re creating efficiency and a flow of traffic that is ideal for outdoor entertaining. 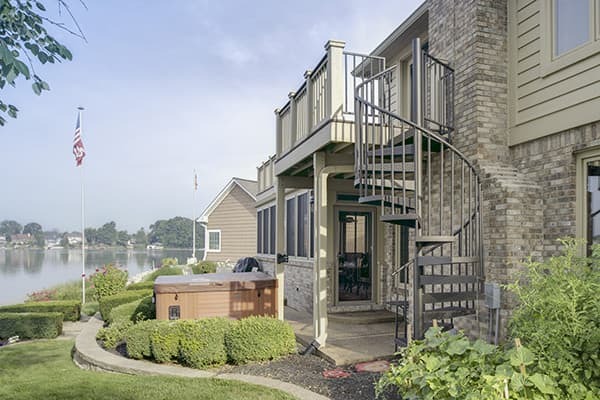 Traditional deck stairs are always an option. However, their frame can quickly become blocky and take up a large amount of space in your backyard. This goes against any small backyard ideas that are trying to maximize your space. A spiral stair lets you safely access both levels of your backyard without the large intrusion of a straight stair. The footprint of a spiral stair is kept to a small circle in your backyard. With the different design options of a Galvanized Exterior spiral stair and an Aluminum Powder Coated spiral stair, you are sure to find the best spiral stair for your home. The Galvanized Exterior spiral stair is a carbon steel staircase that has gone through a hot dip galvanizing process that coats the stair in a maintenance free barrier. The stair has a metallic silver finish that weathers over time to become a battleship grey. The Aluminum Powder Coated spiral stair can complement any home design with the custom color options. The naturally rust prohibitive aluminum staircase is given an extra weather proof finish through a powder coating process. Your stair can be kept a classic black or white color, or you can make it a show stopping centerpiece and choose a custom color. If you want to keep your outdoor structure on the ground level, you can choose to install a backyard patio. The most common patio design is a square or rectangular poured concrete platform. This may seem like a boring design option, but concrete has more possibilities than you think! You can use a concrete stamp to make faux tiles out of the poured concrete. This gives a polished look to your patio without the cost of tiles and individual installation. For a completely unique design, you can use concrete stains to add a marbled finish to your concrete patio. These stains, either acid or water based, react with the concrete to create unique marble patterns on your patio that you won’t find on any other concrete surface. An acid based stain will produce earth tones and aqua colors. Water based stains act more as a paint and have a wide range of available colors. You can also use wood tiles to give your patio a more traditional look. The alternating patterns of the wood grain an interesting visual element to your outdoor space. The key is to stick to one surface material. While there are a ton of amazing small backyard ideas, you don’t want to overwhelm your small space. Keeping consistency in materials helps your space to feel more open and less crowded. There are a few different designs of a patio other than your standard patio. Floating platforms are a popular option for modern homes. These patios will be made from wood panels or the previously mentioned wood tiles and have a luxurious resort look to them. If you want to take the floating platform design to a new level, use cascading platforms. This patio design is for homeowners that don’t mind losing a lot of green space in their backyard. These smaller patios can be decorated and used separately, or used as a large extended outdoor entertaining area. If you have a second floor deck, you can still have a patio. Under deck patios are the perfect solution for homeowners that want different outdoor entertaining spaces. The deck can be uncovered and used during warm weather, while your under deck patio has a ceiling thanks to the deck above. This makes it an ideal space for rainy days. Whether you decide on a deck, patio, or both, the same furnishing principles can be applied to complete your small backyard makeover. When you’re dealing with a small space, simplicity is most important. Just like your surface materials, too many ideas incorporated into your outdoor furnishings can make the space feel cluttered and overwhelming. You also have to prioritize the different functions of your backyard. Because of your limited space, you won’t be able to fit all of your small backyard ideas into one place. One way to open up your space is to continue your interior design aesthetic in your outdoor space. By treating your patio or deck as an extension of your indoor space, you are making it feel larger. When you decide what furnishings you want to include in your backyard, be sure to keep them scaled to your space. For instance, if you want to have outdoor dinner parties but have limited space, don’t get an outdoor dining table that seats 10 guests. Instead consider smaller café tables or a small scale farm table. These options have smaller seating options as well. Instead of large outdoor chairs, you can use decorative folding chairs or benches that fit underneath the farm table. Use your outdoor lighting to add to the décor rather than large items. String lights are the perfect addition to any backyard, big or small. They can be installed essentially anywhere and come in different colors and aesthetics. Smaller pops of color can also had life and bright your space without overwhelming it. Use brightly color cushions for seats or tableware for outdoor dinner parties. These are easy and budget friendly ways to take your small backyard space to the next level. If you want to add a wow factor, create a visual focal point. A pergola is the perfect combination of visual interest and functionality. Not only is it a beautiful centerpiece that can be incorporated on either a deck, patio, or in the backyard, but it also provides some shade and shelter from the rain. When a homeowner has a small backyard, most think that a backyard pool is out of the question. However, a personal pool isn’t limited to full size large backyards. You don’t need to have a huge swimming pool to get the benefits. Just like your furnishings, you can scale your pool to fit your backyard. With different designs and layouts, you can easily find the right pool for your home. You can use your existing patio as your pool deck, or have the pool as the focal point of your small backyard makeover. Rectangular and square pools are the natural choice as they fit into the corners of your backyard. However, with the right materials, a circular pool can fit into your small backyard as well. Depending upon the size of pool you’re looking to install, it will probably fall into two categories: plunge pools and lap pools. Plunge pools are the smallest option and are built with the purpose of relaxing and cooling off. Lap pools are a little bigger and are meant to be used for actual swimming and exercising. No matter which size you go with, it will either be an above ground pool or an in ground pool. Above ground pools are a great option for small backyards as they don’t require any additional landscaping or construction. Because you don’t have ample space in your backyard, you want to avoid having to dig up your entire space. If you want the convenience of an above ground pool, but like the look of an in ground pool, you can build your patio around the deck. This gives you a pool deck that you normally won’t find with an above ground pool. This also has the design aesthetic of a pool that’s built into your patio. Modern and minimal home design have begun to feature glass walls in their pools. If you want to leave your pool as a stand-alone structure, or leave a wall exposed, this is a great way to add visual interest. For an industrial look, concrete tanks have begun to make their way into backyard home designs. These pools are meant to be a statement piece and can also fit into any minimalist home designs. In ground pools are the more traditional pool design. If you don’t mind some extra construction, your pool will last long term. Even if you decide on an in ground pool, you can still build your patio around it. The only difference is that your patio will be a true ground level rather than a raised porch. If you want a chic and modern backyard, rectangular shapes are best. These long skinny pools can easily be tucked against a fence line. Some ambitious homeowners decide to take on their in ground pool as a DIY project. This may seem like a complicated project, but it’s definitely doable. By using shipping containers that are already welded to have a watertight seal, there are a few alterations that have to be made to make them pool ready. You can buy shipping containers in a number of different sizes that fit plenty of different backyards. You can maximize space in your small backyard by creating a cement walkway that connects your porch to the other side of your pool. These small pillars give your pool placement flexibility. For a completely different design aesthetic, create a small backyard oasis by using natural elements around your pool. Line your pool with large lake rocks and tall grasses to hide any edges of the pool frame. For those that want a tranquil place to enjoy nature, a small backyard garden is just the thing you need. You can always have a garden bed incorporated into your standard small backyard design, but a full garden design is unique. You can use bright and beautiful flowers as the pop color in your small backyard design. 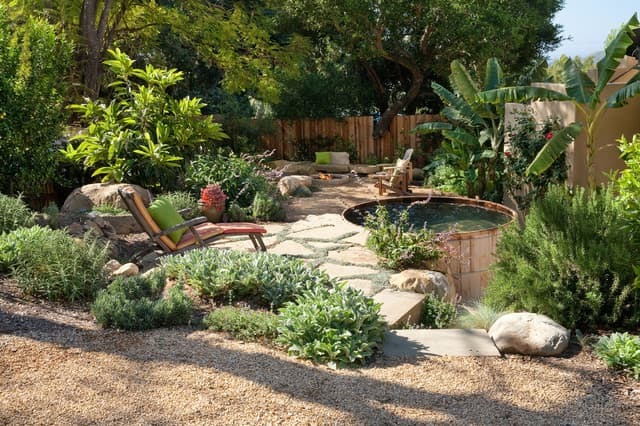 There are a few different small backyard garden designs that you can utilize. A vegetable garden is a great addition to any home that is looking to increase their self-sustainability. The garden gives function to an area that is typically about aesthetics. With recent eco friendly trends taking the world by storm, this garden application has grown immensely in popularity. Many people enjoy knowing where their food comes from and love a farm to table style of cooking and dining. The vegetables and herbs that will thrive in your backyard vegetable garden will vary depending on your climate and the time of year. As you can see, vertical growth is a common theme in small backyard ideas. The same theory can be applied to your gardens as well. By growing your gardens on a vertical axis, you are able to maximize the space that you currently have in your backyard. Vertical gardens come in several different categories. You can tier your planters to create a stair step garden which still has a footprint on the ground, but saves space. If you want to have a completely vertical garden, you can use a living wall. These panels have the soil and plants built into their interior framework. This means that there is no virtually no footprint. They are a great accent for patios that are looking for a unique style. If you want to add a little more privacy to your backyard, use a plant privacy screen. These pieces are the meeting place of function and beauty. By using climbing plants on a lattice panel, you can add some extra privacy to your space. If you want to create an outdoor space that will wow your guests, use a combination of trees and plants to turn your small backyard into a backyard oasis. This secret garden design makes your garden the focal point of the home. Create a contrast in your backyard by using different combinations of plants. From large billowing bushes to smaller flowers, you can strategically place your plants around the garden, just like you would your furniture indoors. Don’t keep your garden at ground level. Incorporate living fences to add height and to enclose your space. Trellises paired with climbing plants can also add height, but they also have a whimsical nature to them. Different climbing plants can give your small backyard oasis a completely different aesthetic. Ivy is a traditional choice as it is known for being low maintenance and growing quickly. Roses are the ideal flower choice for anyone looking to create a classic English garden in their backyard. They come in a variety of colors and are easily recognizable to any guests. If you want to create an experience with your flowers, consider using honeysuckle or jasmine. While they both have very different scents, they fill the space with their floral notes. Transport your guests to and Italian villa by growing grape vines around your trellis. This plant will take a little longer than others to flower, but it will definitely add a wow factor to your backyard. When you’re looking for furnishings in your backyard oasis, keep them small. Large clunky furniture can look out of place in the delicate garden that you’ve created. After you’ve put all of the work into your oasis, you don’t want to distract from it with over the top furniture. Small round café tables fit well into your garden and can easily be tucked into a corner. Most of these designs only seat up to 2 people at a time, keeping the space from being over crowded. Café tables can either come in an ornate wrought iron design with decorative legs or in a simple pallet design. Whichever material you choose, you can find matching chairs. Rustic white wrought iron furniture that has been slightly distressed is the perfect balance of femininity and durability. For standalone seating option, small wrought iron benches can be placed throughout your garden for a private place to enjoy your surroundings. If all of these designs seem a little overwhelming, you can still incorporate a garden into your backyard on a smaller scale. By keeping them small, you’re not losing any of the beauty. You’re just making room for other things you want to feature in your backyard. 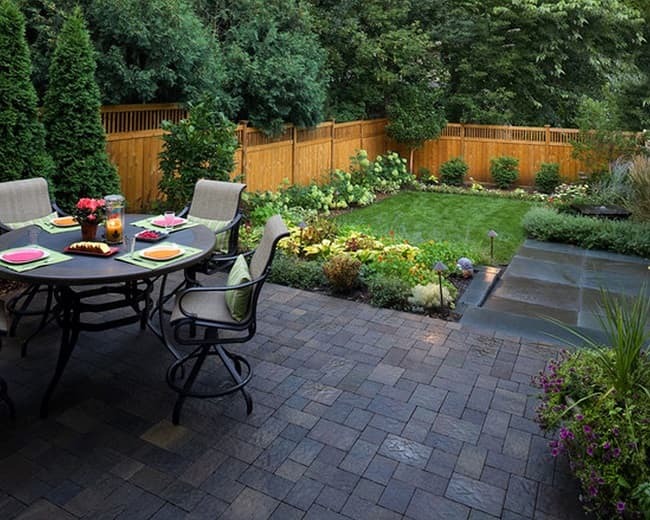 Remember, a key to a successful small backyard makeover is prioritizing your design ideas. If you have a second floor deck and are looking for a way to hide the vertical supports, you can use strategically placed plants. Use tall grass and large bushes to hide the large wooden posts. This can soften the harsh lines that your deck pulls into your backyard. If you have a one level patio, repurpose an old birdbath to create a unique planter. This makes your small accent garden mobile and low maintenance. If you have kids, you want them to be able to enjoy their backyard. If you have a small backyard, green space is at a premium. If you want to create a play area for the kids, but also keep outdoor entertaining space, it can be difficult to find that balance. A playset that has several different activities built into it seems like a great option. It keeps everything in one place and one footprint. However, many of the designs on the market for a backyard playset are huge. They take up lots of space in your already small backyard. Some companies offer a custom design playset that you can design to fit into your space. These can be expensive, despite their small size. Another solution is to build your own playset to fit into your small backyard. A custom DIY playset isn’t nearly as complicated as you think. You can build the structure to fit your space and customize the features to fit your child’s interests. A DIY playset also means you can customize your material without any extra costs from a contractor. Wood is the traditional material used and is can take on any design aesthetic you choose through the use of stains and paints. It will need to be sealed and refinished every year to stand up to heavy foot traffic. Composite materials are limited in color but it’s the most durable material available. There is little to no maintenance involved when using composite materials. No matter which material you decide to use, there are three main categories of backyard playsets that you can choose from. If you have a traditional home design, you may want to feature a classic playset design in the backyard. This ties your entire home design, both front and back, together and provides a consistent design story throughout your space. These playsets are an all in one design with a large variety of activities in one structure. These are the most common designs for prefabricated structures on the market, and can easily be recreated as a DIY project. It’s a standard frame with a raised structure that can be access by a ladder and has a slide to exit. A swing set is a staple in these traditional playsets and vary in their design. You can have a traditional swing set or feature a tire swing at the center of the frame. For extra fun, you can add climbing features as well. Small rock walls or climbing nets add another means of access to your raised structure. No matter which features you design to include, these playsets are compact and keep everything close together. This makes them ideal for small backyards with limited space. If you want this compact design, but want to add a little more fun to your backyard, change the frame around! Designs can vary between a traditional frame with an awning to playhouses, castles, and even pirate ships. Vertical builds are making another appearance in your small backyard ideas. Treehouses are a classic backyard structure and can appeal to children and adults of all ages. If you have limited backyard space, why not apply the same logic of a deck to your playset? 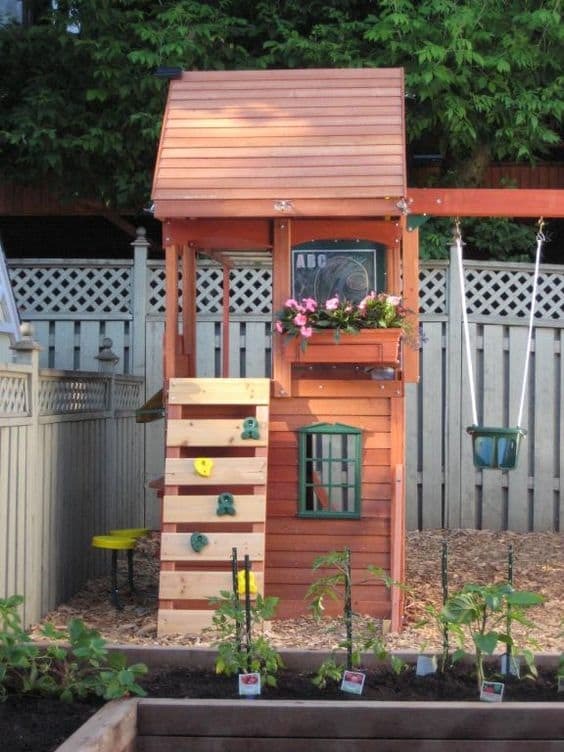 By elevating your playset and making it a treehouse, you’re opening up your backyard for more activities. Obviously to make it a true treehouse, you’ll have to have a sturdy and pre-existing tree in your backyard. If you don’t have a large tree in place, you can create the same effect by putting your playhouse on supports and raising it above ground level. Take a tip from the garden section and hide the supports with large billowing plants for a floating house effect. This whimsical design adds some fun and adventure to your backyard and plays into a child’s imagination. Your options of additional are truly endless and can be customized to your child’s interests. From pirate themes to small reading nooks, all of them can be included in a unique treehouse design. Different treehouse stairs options can not only provide a safe means of access, but also add the finishing touches to your small backyard design. If you’ve already built vertically in your backyard and included a deck, use the unused space underneath to create a unique play area for your kids. Under deck play areas are an easy DIY project because of the pre-existing frame. The vertical supports outline the space for you and gives your kids a defined play area. Maximizing space is a huge part of making the most of your small backyard and utilizing the previously unused space underneath your deck is an ideal application. 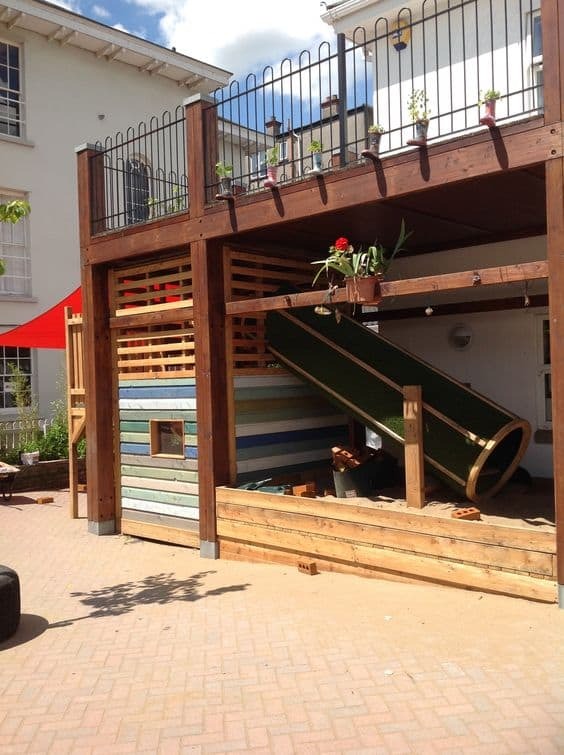 The deck above the space can give the kids shelter on a rainy day, but also provide shade on a particularly hot day. This gives your kids a safe place to play that is close by. Add gates to the railings lining the play area for an extra safety feature. There’s plenty of room to add a table and chairs set for parents to sit and watch the kids while they also relax. 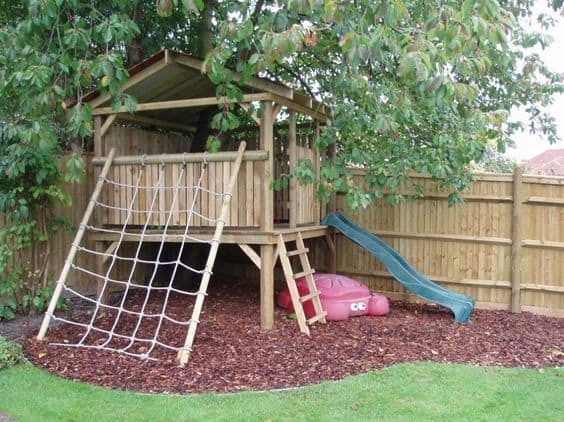 This particular under deck playset design combines both a playhouse and an open play area. The slide that comes down from the deck adds a fun feature to the rest of your small backyard design. This hybrid design has plenty of different options for different kids. When you’re looking to create a focal point in your small backyard, nothing adds more of a wow factor than a water feature. Water features come in a wide variety of styles and aesthetics, making it easy to find the perfect addition to your backyard. They also have the flexibility to be placed almost anywhere in your backyard. Based on where you decide to put your water feature, it will be completely unique to your backyard. Whether you decide to incorporate an in ground piece or use a standalone design, you can benefit from the relaxing characteristics of having water as a part of your backyard. Water features also act as a mirror in your outdoor space and reflect the nature around it to make your backyard look larger. If you can’t find the right water feature for your backyard, there are surprisingly easy DIY projects to create your own custom designs. Natural bodies of water have a sense of wonder attached to them that would be welcome in any small backyard. Just because your space is small doesn’t mean that you can’t have grand designs in your backyard. 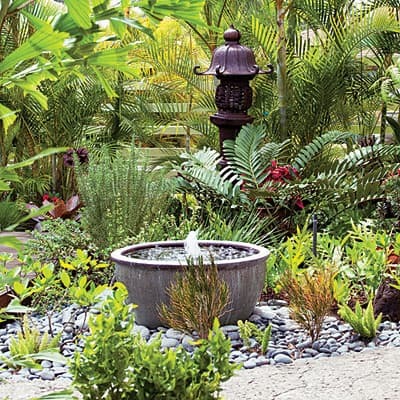 If your property wasn’t blessed with natural water features, you can easily make your own. Man made ponds are very common in backyards that are looking to add dynamic natural beauty that goes beyond a garden. One popular way to create a small pond in your backyard is to use an old tire. You just need to dig the hole, line the tire, and fill it with water. The true beauty comes in when you start to add the vegetation and natural elements around the pond. Lining the edge of the pond with different sized and shaped lake rocks gives it a rustic look that makes the pond feel like it’s a natural feature of the landscape. There are a few different plants that you can use around your pond depending upon the aesthetic you want. They range from flowers that do well around the edges of the pond bed to plants that float on the water’s surface. Use plants that will not only look beautiful, but also function in the space. For instance, stagnant water, like that of a pond, tends to attract mosquitoes. You can use lemongrass, a large grass bush that naturally repels the insects. If you want to create your own small eco system in your backyard, you can add fish to your pond. The two most common fish types for backyard ponds are koi fish and goldfish. It may seem like a goldfish is an underwhelming choice, but they actually grow to fit the size of their environment. If you live in an area with particularly cold winters, make sure your pond is at least 18 inches deep to support any wildlife living in the pond. You can use your pond as a separation in your yard as well. By making two different spaces, you’re creating the illusion of a bigger space. Dig your pond in the middle of the yard and incorporate a small bridge to move from space to space. While they may seem similar, reflecting pools are very different from ponds. 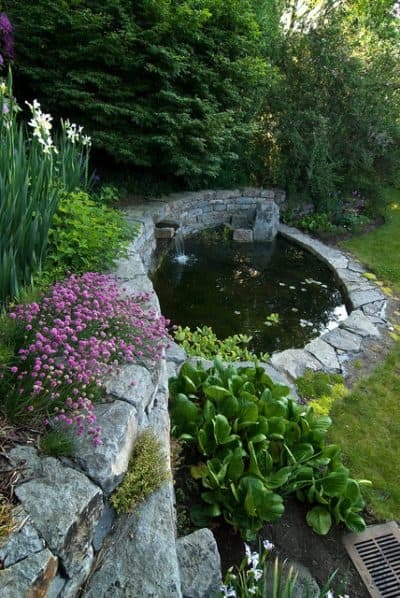 Ponds are meant to tie in nature and have a rustic and natural look. Reflecting pools have sleek and smooth designs that are modern. They are shallow bodies of water that are usually either square or rectangular in shape. These natural focal points don’t need a lot of room to make an impact. With no interruptions from fountains or people, the surface is completely smooth and has a solid base from the shallow pool. This makes it a living mirror that will clearly reflect its surroundings. Reflecting pools are commonly featured in gardens, park, and memorial spaces as a place for people to relax and take in the natural beauty of their surroundings. The frames are usually made from metal, concrete, or a combination of the two. The sound of running water is known to be relaxing and promote tranquility. This makes a backyard fountain a natural fit for a backyard that is designed to be a peaceful hideaway. Garden fountains come in a number of shapes and sizes. The larger fountains can be found at the center of public gardens and parks. These feature the iconic basin with a center column and water feature. These designs are probably too big for your small backyard, but there are plenty of scaled designs that can fit your space. Small garden fountains have tons of different designs that range from cherubs to simple bowls. A lot of them are a multilevel design which can add height to your backyard garden. You can choose from a few different materials based on your desired design aesthetic. Stone fountains can be simple and classic in design or feature a rustic natural look. The classic stone fountain has a basin and a small multilevel feature. The natural stone fountains look like stacked rocks with a small waterfall running through them. This is a great design to incorporate around a pond. The other common material found in garden fountains is metal. Metal fountains range in design styles for a rustic pail to an ornate Victorian design. These fountains are meant to be conversation pieces, whether they are the focal point or a small feature on the side. They almost always feature a multilevel design that uses the weight of the water to progress the water flow. Don’t view your small backyard as a limiting piece of your home design. Instead, a small backyard means the opportunity for creative design. You can use new and innovative ideas to maximize the space in your yard. Create a backyard that fits into your lifestyle and your home.Whether you plan to use it for outdoor entertaining or as a relaxing get away right in your backyard, there are plenty of design options.